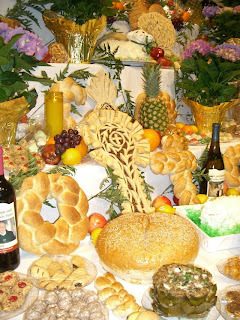 Sicilians celebrate St. Joseph, the foster-father of Jesus and patron saint of Sicily, by building an altar upon which they laden decorative breads, food, wine, cookies, candles. 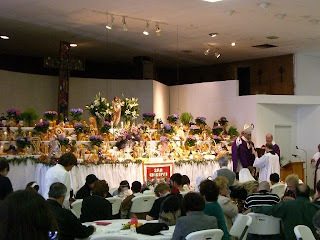 Our mother has memories of her grandmother's home altar each March and the special breads and cookies she made, while I only remember seeing photos of that altar and a few tables as examples at Italian Festivals. 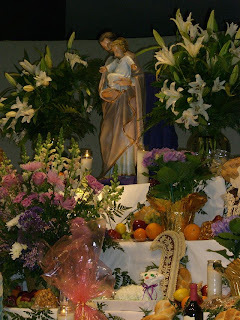 Three years ago, my family participated in the Festa de San Giuseppe at St. Frances Cabrini church, a truly spectacular event. My daughters dressed as "Saints" - St. Agnes, the 13 yr old virgin martyr, and St. Elizabeth of Hungary, the princess who fed the poor and built hospitals for the sick during the Middle Ages. They processed into the church along with other children dressed as saints, Joseph, Mary, St. Frances Cabrini, St. Elizabeth Ann Seton, St. Francis of Assisi, St. Jude, St. Lucy, Blessed Mother Theresa, St. Therese of the little flower, St. Clare, and others. 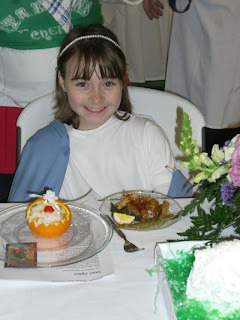 All of the "Saints" sat in the front pews during Mass and then presided at the head tables where they tasted all of the special foods prepared for the feast day. 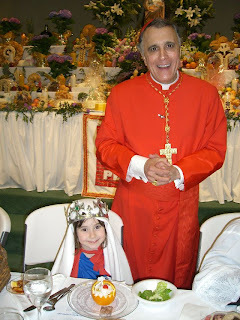 We had the great honor of hearing Mass celebrated by Cardinal DiNardo. I cannot recall a time I've ever heard the Litury of the Eucharist sung in chant, but he did and it was beautiful. His homily embodied humor, relevance to the readings, thought-provoking moments - and he literally brought down the house when about three-quarters through the fire alarms sounded. He stopped and casually remarked that it wasn't he first time he's used so much incense that the alarms went off. After repeated attempts to continue, only to have the alarms go off again, he was finally able to resume and finish the homily. During the final announcements, the Pastor, Father Fabj--who is known for his short on-target, pointed homilies--smilingly told the Cardinal that the alarms weren't for the smoke, but as a warning against long homilies. The Cardinal laughed with sincerity. After Mass, the Cardinal entered the hall and blessed the altar. He spoke with a few of the children and posed for a few photos. 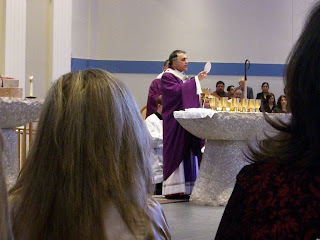 Then he left to make an appearance at the other Mass. When he returned, he sat at the head of the table to eat, with a large white tablecloth carefully tucked over his red garments. Everyone must be served, no one can be turned away, and the food was delicious! Pasta with red sauce, boiled eggs instead of meatballs (Lent) and breadcrumbs, spinach, fava beans, bread, and cookies - oh the cookies. The Saints had to taste a little bit of everything on their plate. After that, many ladles of pasta were delivered. We've been invited to participate for the past two years, but our Spring Break travel schedules conflicted with the dates. I'm so happy that my daughters had this experience in their life and hope to repeat it again in the future.